For spring break this year, skip the boring ocean cruise and instead set sail with Joel, Mike and the bots on a madcap journey aboard the Satellite of Love! On March 24th, 2015, Shout! 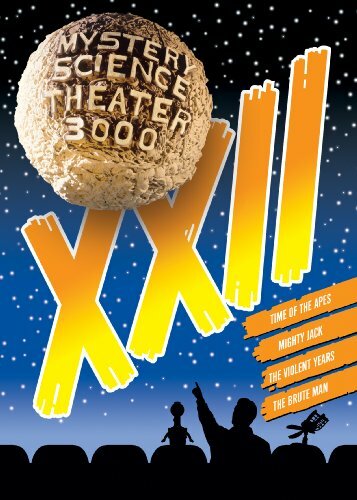 Factory will release Mystery Science Theater 3000: Volume XXII , featuring four never before on DVD episodes Space Travelers, Hercules, Radar Secret Service and San Francisco International. The DVD box set is also filled with bonus features, including brand new episode introductions by Frank Conniff, new featurettes Barnum Of Baltimore: The Early Films Of Joseph E. Levine; Marooned: A Forgotten Odyssey; Sampo Speaks! A Brief History Of Satellite News and MST-UK with Trace and Frank; as well as theatrical trailers and four exclusive Mini Posters by artist Steve Vance! They were four total strangers, with nothing in common, except themselves. A space drama, a sword and sandals epic, a '50s spy film and a TV pilot about an airport. Before the experiment was over, they broke the rules and made us cringe in ways we never dreamed possible. In this 32nd collection of episodes from the cult comedy series Mystery Science Theater 3000, Joel, Mike, Tom Servo and Crow spend detention aboard the Satellite of Love with a breakfast club of cheesy movies. To our everlasting good fortune, though, they endure the punishment by delivering a steady stream of wisecracks, and it's definitely some kind of wonderful. Mystery Science Theater 3000: Volume XXII gives us Radar Secret Service, an atomic age bomb of a spy thriller from Sam Newfield and Robert Lippert that features G-Men tracking stolen Uranium ore using radar and an even stealthier weapon — an undercover blonde! Space Travelers, a dramatic, Academy-Award© winning (really!) tale of about astronauts trapped in space that stars Gene Hackman, Richard Crenna, Gregory Peck and Lee Grant; Hercules, the first of the score of Italian Hercules movies, starring Steve Reeves as the legendary strongman who helps Jason retrieve the Golden Fleece and reclaim his rightful throne from his scheming uncle; and San Francisco International, a made for TV movie / backdoor pilot that never got off the ground. Pernell Roberts leads a respectable cast in this "day in the life" story of an airport and its maverick chief of security.